What is innovation? I think Innovation = creativity + implementation. The ingredients of innovation are people, their needs, technology and business. You can have a great idea but how do you put it into action? The world is changing at a furious pace and today’s physicists, technologists and designers are empathetic to people’s needs and are looking for ways to integrate internet technologies into the home of the future. You will be surprised at what they are cooking up in their laboratories. For example, Microsoft and New York Times Research & Development Lab have both been working on the “Smart Mirror.” Like the fairytale, “mirror, mirror on the wall” can provide you with all kinds of information built from Kinect motion-sensing technology. 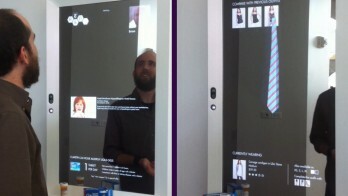 The magic mirror turns into a screen of information by reading physical cues from its user and by using voice recognition. You can get the daily NY Times news, check email or calendar, use it to go shopping or check on your social networks. Below, the picture on the left shows how the screen recognizes prescriptions and off-the-shelf drugs and lists directions for use.